Explanation: What in heaven's blazes is that? 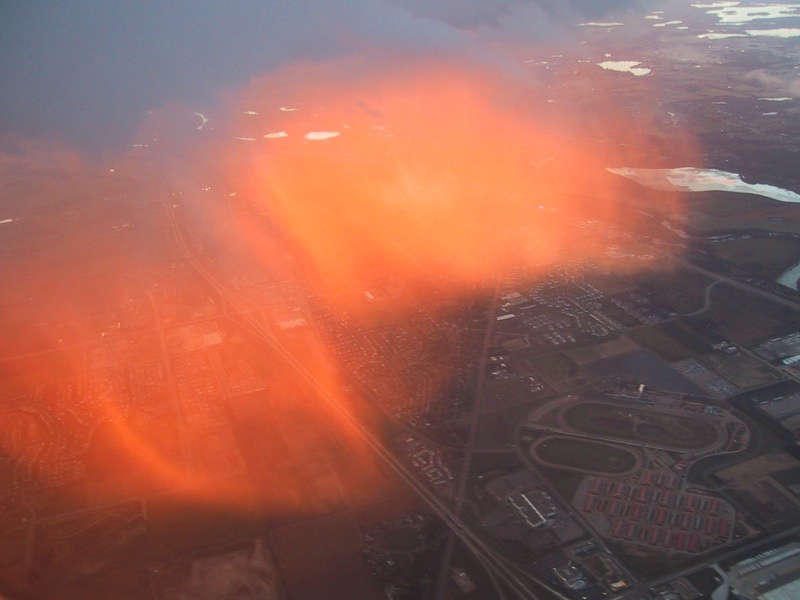 When landing in Minneapolis, Minnesota, USA in 2002, just after his flight descended below cloud level in the early evening, passenger Tyler Blessing saw and photographed "huge curved sheets of glowing light extending from cloud to ground." The glow appeared unlike other unusual lights more typically seen, including crepuscular rays, anticrepuscular rays and the glory. A leading possibility, mentioned initially by the photographer, is that the light sheets are setting sunlight scattered off of falling rain. Alternatively, the phenomenon could just be a peculiar window reflection. APOD readers, who have previously shown an impressive ability to pool their collective intelligence to create a better understanding of photographed sky anomalies, are invited to discuss this online. It might help to know that EXIF data indicates that the image was captured on 2002 September 23 at about 8:07 pm in the evening (local time), and that the camera was reported to be pointing north of west at that time. The oval on the ground, visible in the lower right of the above image, is Canterbury Downs race track.